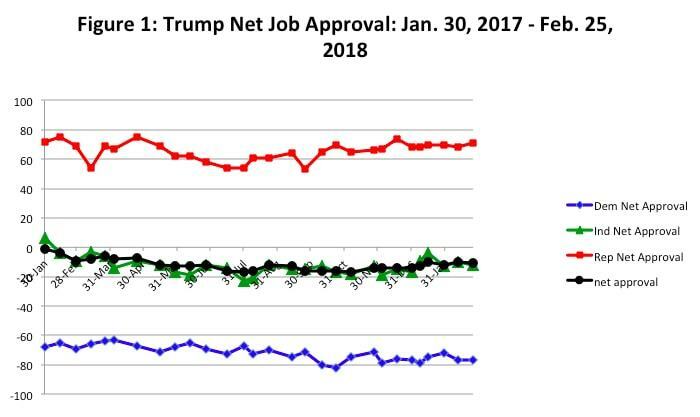 Figure 1 shows Trump’s net approval ratings by partisanship and overall net approval rating. The data show that Independent approval almost perfectly tracks with overall net approval. This is because Democrats were anti-Trump in January of 2017 and have remained so over the first year-plus of his presidency, counterbalancing Republicans’ largely favorable views; meanwhile, Independents’ net approval ranking at the start of the Trump presidency was a positive eight points but declined over time, falling to minus-23 in July 2017. The passage of the tax cut boosted the president’s net approval score among Independents from minus-17 in December to almost even in January 2018. Since then, he has slipped back into negative double digits (minus-12 in late February). Among Republicans, the turn away from the failed Obamacare repeal efforts to the successful bid to cut taxes brought Trump back into the 70 percent net approval range and higher. None of this moved Democrats, whose antipathy seems a permanent part of the Trump landscape. And while underwater among Independents, Trump has improved his standing somewhat. As weak as Trump is among Independents, he is weaker still among women. On January 30, 2017, his net approval among men was plus-7, while among women it was minus-9. By February, the latter negative rating had fallen into double digits, and reached a low of minus-28 in October-November of 2017. The president gained back some ground in the subsequent four months, but was still at minus-18 in the final February poll. By contrast, Trump managed a very small positive net approval (plus-2) among men in the same survey. 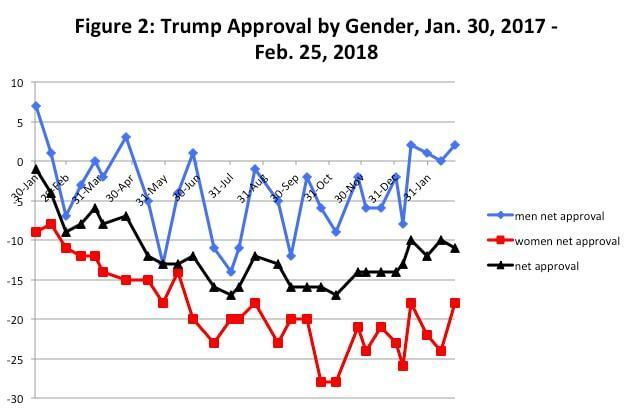 This gender gap in presidential approval ratings has been a constant throughout Trump’s term in office. As Figure 2 illustrates, his net approval rating among men has always exceeded his overall net approval, while his net rating among women has been consistently below that mark. This gender gap is significant in itself -- after all, women tend to vote at higher rates than men -- but it becomes even more salient when we consider it in the context of partisanship. Trump’s poor performance among women poses a pronounced threat to his re-election ambitions. In August of 2017, YouGov began asking the following question: “Do you want Donald Trump to run for president in 2020?” As of March 3, 2018, only 32 percent of all respondents answered “yes,” while 51 percent said “no” – with 17 percent “unsure.” Declaring you don’t want a sitting president to run for re-election is a serious statement about your preferences. Historical examples show that even voters who approve of a president’s job performance might, for various reasons, prefer that he step aside in the next election. That trend is pronounced with the current Oval Office incumbent. Even among the survey respondents who “somewhat approve” of Trump’s performance, only 49 percent said they wanted him to run again. Trump’s re-election numbers with women and Independents are particularly problematic for him. 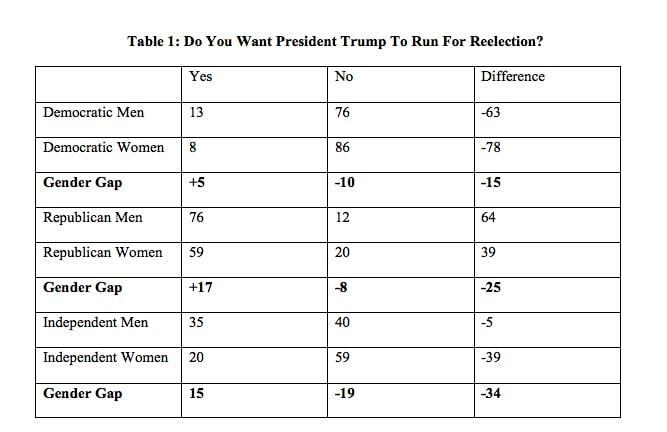 As Table 1 demonstrates, the gender difference in the net percentage of Democrats who want Trump to run again is 15 points. By contrast, the same gender gap is 25 points among Republicans, and a whopping 34 points among Independents. Overall, only 20 percent of Independent women (and less than 30 percent of Independents overall) want Trump to run for re-election. Given that Trump needed a healthy majority of Independents to win in 2016, his lackluster support among this group should cause him and the GOP substantial heartburn. Today, Donald Trump is not quite as unpopular as he was prior to the passage of the Republican-enacted tax cut and reform bill. Nevertheless, he is still performing poorly, particularly among Independent women and highly educated Republican women. This situation bodes poorly for Trump and his fellow Republicans; in every midterm election since 1966, women have voted in higher numbers than men. In 2006, the last time the Democratic Party succeeded in the midterms, female voters favored Democrats by 10 percentage points. This year, the result could be even more lopsided. If Independent and Republican women continue to signal their disapproval for the president at the polls, November 6, 2018 could be a long night for the GOP. David Brady is a professor of political science at Stanford University and the Davies Family Senior Fellow at the Hoover Institution. Brett Parker is a JD/PhD student at Stanford University.